In this Rhyming Puzzle printable pack, your child will gain practice in listening to the sounds within words and hearing their rhyming endings. It has a friendly whale theme perfect for summer or ocean-themed units. It’s important to note that these are not “word pattern” recognition cards, but simply to be used for sound recognition, such as when teaching a poetry unit and looking for words that are similar in ending sound, but not necessarily in the same word family. This pack would be most appropriate for children in 2-4th grade, who have nearly mastered phonics and spelling, and to prompt discussion about the sound patterns of the English language. 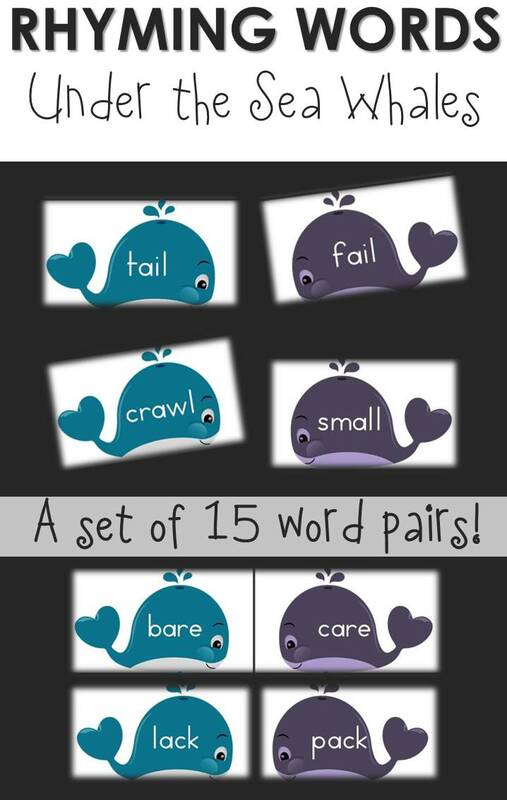 Try these rhyming cards with a cute whale theme in your homeschool today! The promotional period for this freebie has expired. You can now find this printable in our membership area. Click here to learn more about our memberships!